PTV Optima 17 comes with a new interface connecting the PTV technology to the Sydney Coordinated Adaptive Traffic System (SCATS) offering more data and facilitating the integration in thousands of cities where SCATS is available. Other new features include TRE dynamic equilibrium assignment algorithm, extended data fusion engine, predefined data API and HyperPath Alternative Paths. PTV Optima 17 can now be connected to SCATS to further optimise a city’s network in real-time. Enriched with more data, the goal is to reduce delays, increase a system’s efficiency and reroute vehicles around congested intersections or accidents. To deliver measurable results and to ensure the best timing of signal phases for any traffic situation, SCATS uses sensors at traffic signals and induction loops installed within the road pavement. As the different traffic signals communicate traffic data amongst themselves, they synchronise and minimise wait times at intersections. Users of PTV Optima 17 benefit from this additional data input and can make more informed decisions as they know the exact traffic flow at every intersections and traffic signal. PTV Optima 17 also comes with an optimised engine for offline calibrations. The TRE (traffic real-time equilibrium) dynamic assignment algorithm is the core of PTV Optima 17 and has received an update to make more accurate offline assignments. This results in a more precise model which in turn improves the predictions for the entire system. What is more: As calibrating and validating the model takes up less time, the new release increases the efficiency of the set-up process. Users of PTV Optima benefit from a shorter set-up process saving them time and money. As PTV Optima combines proven offline traffic modelling with real-time data, it is not only the sheer amount of data that benefits users. It is also about the right mix of data coming from various sources that allows for more accurate predictions. The extended data fusion engine of PTV Optima 17 supports not only the ingestions of floating car data, automatic number-plate recognition and road aggregated detector information. Now, the PTV solution is also able to ingest single lane-based traffic counts to determine more accurately where traffic stands still. This equips traffic management centres with very detailed information, on which to build their intervention strategy. But more importantly, it facilitates the system integration process, as it is no longer necessary to aggregate by road direction. 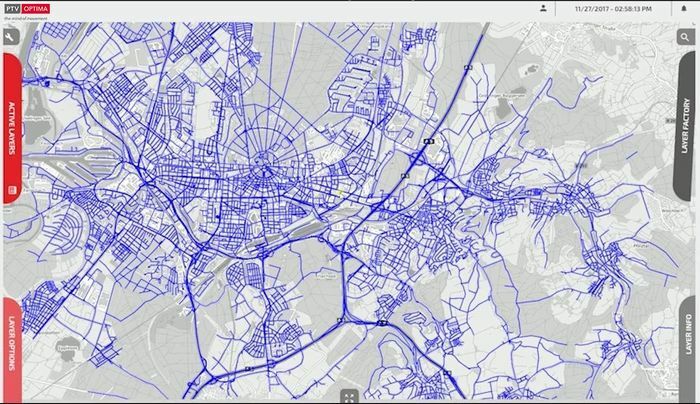 Instead, the traffic data can be sent directly from the lanes and PTV Optima 17 takes over the aggregation from there. Apropos facilitating the integration: With the Predefined Path API, PTV Optima 17 also debuts a new API to define and monitor corridors, for example main arteries of a network. 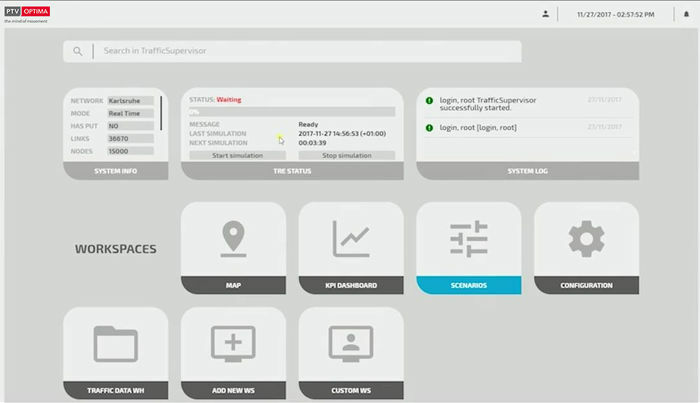 System integrators or IT managers can call this API from a third-part software component without switching to the Traffic Supervisor, PTV Optima’s web-based graphical user interface. As cities stay ahead of traffic using a precise and reliable real-time traffic management system like PTV Optima, this also includes providing multiple alternative paths, ready to be integrated into navigation solutions, such as urban mobility apps. 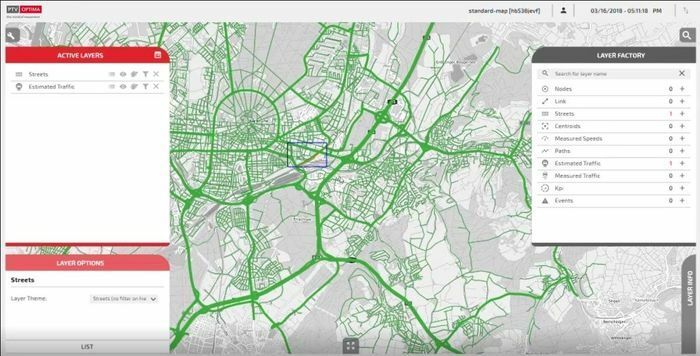 With PTV Optima 17, cities can use the multi-modal journey planner, HyperPath, to balance the usage of their network and prevent highly used roads from getting even more packed with vehicles. Based on the predictions by PTV Optima’s ETA module for public transport, HyperPath proposes more accurate and updated alternative routes to facilitate navigation.